As Thomas Friedman once said, “Necessity is the mother of invention.” Two educators have developed a radical pedagogical theory solving an timeless problem that has plagued education for decades. The historic is so remarkable that two professional institutions, ASCD and ISTE rushed to joint-publish the work, as they say in the trade, before the crayon dried on the page. The profundity, clarity of vision, and transformative nature of “The Method” generates a force field of exuberance that repels the “scientific” findings of such 20th Century institutions as Stanford University and Harvey Mudd College. This paradigmatic shift transcends the need for academic references or even a bibliography. We are asked to believe and thousands of school administrators have heeded the call. If you would like to learn more about how to insure that students don’t miss a precious instant of your lecture while off at sport practice or music lessons, click here. However, if one is truly committed to making the world better for kids, “voice,” is nice, but inadequate. “Voice” absent of power is often little more than propaganda or exploitation. While I’ve been on a brief social media “skunk at the garden party” hiatus, Dean Shareski has generously filled-in by sharing his queasiness over the “viral” Goldieblox video being passed around the Web. Señor Shareski set his BS detector on high and has provided evidence that the “amazing” Rube Goldberg machine “made by girls” is merely a commercial for a new toy called, Goldieblox. It just doesn’t seem that Goldieblox has any chance of measuring up to the self-promotion and hype of its creator that her box of ribbon and spools is “building women engineers.” I applaud the sentiment, but if we are truly serious about improving the education of girls, it will take a lot more work than a trip to Toys R Us. I could be wrong. I’ve recently been upgrading my initial assessment of littleBits, based on my observations of children playing with the new toy/electronics construction kit. 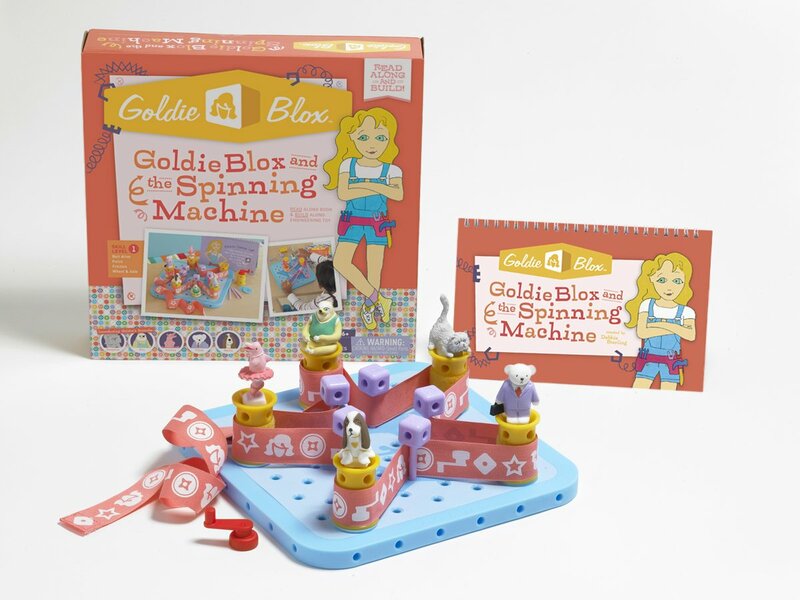 So, perhaps I will soon fall in love with Goldieblox, but I doubt it. In his post critical of the Goldidblox video, Fake and Real Student Voice, Professori Shareski awakened several repressed social media memories I had long forgotten. I took a lot of “brown porridge” when I called BS on the very same videos of yesteryear. There was Dalton Sherman, the “amazing” 5th grader who was coached all summer-long to give a condescending speech, written by the Dallas Schools PR department to Dallas teachers, right before laying off 400 of them. I smelled a rat the second I saw the video. Was called a big fat poo-poo head by teachers on social media and was right. BTW: Dalton Sherman seems to have disappeared just like those teacher jobs. So much for being the voice of school reform. Then there was Michael Wesch (who is an important scholar) made famous by the hostage film he created in which college students decried the state of education. Fantastic. A college class with far too many students in it (200) attempts to revolutionize the educational system by whining in a five minute web video. I’m sorry, but count me unimpressed! How did bashing our own profession become such a popular sport? What possible value could demeaning educators have in a professional development setting? Are we desperate for moving pictures or are they merely a substitute for actual ideas? Aside from their lack of authenticity, what these three AMAZING viral videos of is how children and claims of “student voice” exploit children for propaganda purposes. The Goldieblox video is a commercial selling a toy. We don’t tweet Sir Grapefellow commercials (my preferred boyhood breakfast treat) as AMAZING examples of student voice, so why the wishful thinking about Goldieblox? Señor Shareski rightfully cites my colleague Super-Awesome Sylvia (read Super-Awesome Sylvia in the Not So Awesome Land of Schooling) as a counter example to the fake Goldieblox commercial. I have worked closely with Sylvia over the past couple of years and made her part of the Constructing Modern Knowledge faculty, not because she is cute (she is), but because she is accomplished. She knows stuff. She has skills. She has a great work ethic and is a terrific teacher (at 12). However, talent and achievement did not made Sylvia immune from cynical exploitation by Rupert Murdoch and Joel Klein’s education cabal as documented in an article I wrote for the Huffington Post, Shameless Shape Shifters. As a young blogger in 1971, The Brady Bunch taught me an important lesson relevant here, caveat emptor – buyer beware. Users of social media need to “follow the money,” have a highly-tuned BS Detector, and know when and what they are being sold. Calling everything amazing or everyone a genius is lazy and counterproductive. I’ve been thinking a lot about my friend, colleague, and mentor Dr. Seymour Papert a lot lately. Our new book, “Invent to Learn: Making, Tinkering, and Engineering in the Classroom,” is dedicated to him and we tried our best to give him the credit he deserves for predicting, inventing, or laying the foundation for much of what we now celebrate as “the maker movement.” The popularity of the book and my non-stop travel schedule to bring the ideas of constructionism to classrooms all over the world is testament to Seymour’s vision and evidence that it took much of the world decades to catch up. Jazz and Logo are two of my favorite things in life. They both make me feel bigger than myself and nurture me. Jazz and Logo provide epistemological lenses through which I view the world and appreciate the highest potential of mankind. Like jazz, Logo has been pronounced dead since its inception, but I KNOW how good it is for kids. I KNOW how it makes them feel intelligent and creative. I KNOW that Logo-like activities hold the potential to change the course of schooling. That’s why I have been teaching it to children and their teachers in one form or another for almost 32 years. Turtle Art was created by Brian Silverman, Artemis Papert (Seymour’s daughter) and their friend Paula Bonta. Turtle Art itself is a work of art that allows learners of all ages to begin programming, creating, solving problems, and engaging in hard fun within seconds of seeing it for the first time. Since an MIT undergraduate in the late 1970s, Brian Silverman has made Papert’s ideas live in products that often exceeded Papert’s expectations. There aren’t many software environments or activities of any sort that engage 3rd graders, 6th graders, 10th graders and adults equally as Turtle Art. I wrote another blog post a year or so ago about how I wish I had video of the first time I introduced Turtle Art to a class of 3rd graders. Their “math class” looked like a rugby scrum, there was moving, and wiggling, and pointing, and sharing and hugging and high-fiving everywhere while the kids were BEING mathematicians. Yesterday, I taught a sixth grade class in Mumbai to use Turtle Art for the first time. They worked for 90-minutes straight. Any casual observer could see the kids wriggle their bodies to determine the right orientation of the turtle, assist their peers, show-off their creations, and occasionally shriek with delight in a reflexive fashion when the result of their program surprised them or confirmed their hypothesis. As usual, a wide range of mathematical ability and learning styles were on display. Some kids get lost in one idea and tune out the entire world. This behavior is not just reserved to the loner or A student. It is often the kid you least expect. Yesterday, while the rest of the class was creating and then modifying elaborate Turtle Art programs I provided, one sixth grader went “off the grid” to program the turtle to draw a house. The house has a long and checkered past in Logo history. In the early days of Turtle Graphics, lots of kids put triangles on top of squares to draw a house. Papert used the example in his seminal book, “Mindstorms: Children, Computers, and Powerful Ideas,” and was then horrified to discover that “making houses” had become de-facto curriculum in classrooms the world over. From then on, Papert refrained from sharing screen shots to avoid others concluding that they were scripture. This morning, I taught sixty 10th graders for three hours. We spend the first 75 minutes or so programming in Turtle Art. Like the 6th graders, the 10th graders had never seen Turtle Art before. After Turtle Art, the kids could choose between experimenting with MaKey MaKeys, wearable computing, or Arduino programming. Seymour would have been delighted by the hard fun and engineering on display. I was trying to cram as many different experiences into a short period of time as possible so that the school’s teachers would have options to consider long after I leave. After we divided into three work areas, something happened that Papert would have LOVED. He would have given speeches about this experience, written papers about it and chatted enthusiastically about it for months. Ninety minutes or so after everyone else had moved on to work with other materials, one young lady sat quietly by herself and continued programming in Turtle Art. She created many subprocedures in order to generate the image below. Papert loved love and would have loved this expression of love created by “his turtle.” (Papert also loved wordplay and using terms like, “learning learning.” I’m sure he would be pleased with how many times I managed to use love in one sentence.) His life’s work was towards the creation of a Mathland where one could fall in love with mathematical thinking and become fluent in the same way a child born in France becomes fluent in French. Papert spoke often of creating a mathematics that children can love rather than wasting our energy teaching a math they hate. Papert was fond of saying, “Love is a better master than duty,” and delighted in having once submitted a proposal to the National Science Foundation with that title (it was rejected). The fifteen or sixteen year old girl programming in Turtle Art for the first time could not possibly have been more intimately involved in the creation of her mathematical artifact. Her head, heart, body and soul were connected to her project. The experience resonated with her and will stay with me forever. I sure wish my friend Seymour could have seen it. Turtle Art is free for friends who ask for a copy, but is not open source. It’s educational efficacy is the result of a singular design vision unencumbered by a community adding features to the environment. Email contact@turtleart.org to request a copy for Mac, Windows or Linux. I suppose that school IT departments are a necessary evil, but that does not change the fact that 999 out of 1,000 of them are just evil. Too many school leaders are so terrified of anything that plugs in that they surrender unprecedented budgetary authority and power to folks unworthy of such responsibility. Rather than provide support for the professional educators and children one would think they are there to serve, far too many school IT personnel add unnecessary complication and obstacles to the mission of a school. In way too many schools, teachers report to IT staff who put in place cumbersome policies that conflict with educational priorities and make computers too unreliable to have a significant impact on teaching or learning. In 1990, I led professional development in the world’s first laptop schools. Over the next several years, I helped countless schools “go 1:1.” Until around 1995-96, most schools with 1,000 laptops employed one nice lady you went to when your computer broke. She patted you on the head, wiped your tears and called the vendor to repair the machine. In the mid-90s, everything changed. The World Wide Web decentralized computing by tying computers back together via networks, schools spent a king’s ransom worrying about nonsense like backing up kids’ data, securing the 7th grade computer lab against the Soviets, and installing draconian filtering systems that with each passing year made the Web less reliable or useful to students. Administrative ignorance of computers now had a new friend, paralyzing fear of what kids might find online. Now schools suddenly required an army of IT gatekeepers who if incompetent enough could convince their schools to hire all of their friends. In the K-6 school where I work regularly, we managed approximately 60 laptops last year with no security, networked storage or IT personnel. I wrote the number of each laptop on its underside with a Sharpie and kids knew that if they wanted to continue working on yesterday’s file, they should go back to the same laptop they were using. Everything worked just swell. There were no maintenance issues and computers behaved as one would expect, not the figment of a computer kids have come to expect after the IT Department is done “fixing them.” Schools routinely buy a $1,000 computer and quickly turn it into a $200 “device.” I know we constantly have to defend computers for students, but does anyone EVER question the ROI for school IT personnel? The scenario I just described often leads me to wonder if schools really possess the maturity to have computers. We’re not preparing kids for the future if the computers they’re forced to use don’t function normally or if we confiscate a kid’s machine after they make it operational (see LAUSD iPad clown show). It’s no wonder we can’t have nice things. Today, I saw the promised land. I’m in Mumbai working at the American School of Bombay for a week. This is my third trip here since 2004 when I was hired by the school board to perform an audit of their computer use. This morning, I taught 60 tenth graders for three hours. We began by having all of the students spend an hour or so programming in Turtle Art and then set up three areas where kids could choose to work on MaKey MaKey projects, Arduino engineering, or wearable computing/soft-circuits. Great stuff happened, not just because I’m a badass who can teach 60 kids I’ve never met before to program, build robots and make wearable computers, but because the school’s IT Department was there to help! Let me say that again real slowly… “The ———— IT ———- Department ——— Was —— There —— To —— Help!” Mull that over a few times. The leader of the IT Team received a second-hand note from me saying that I needed some sort of bucket-shaped item for use in one of the MaKey MaKey projects I hoped to interest kids in. He went to KFC last evening and scored a half-dozen chicken buckets for our use – EXACTLY what I needed, but didn’t know where to source in India. I see kids go to the Help Desk and (wait for it) receive help. Yup. I’ve seen it with my own eyes. Every kid who has approached the Help Desk has left happy. Every time I go to the Apple Store “Genius” Bar, I want to take hostages. The school IT Team here at ASB is fantastic, but there is obviously a culture in place that expects and supports such greatness. There must be great clarity in their customer service mission. I am honored to work with them. PS: The network works perfectly and as a guest I have complete access to Facebook and Twitter – booyah! * ASB is a BYOD school, but the device is a laptop of a minimum standard. This adds complexity to keeping every user up and running, but again, no problem at all.